James Hormel, the openly gay San Francisco philanthropist, says he could have likely avoided a nasty Capitol Hill battle over his nomination as former President Bill Clinton’s ambassador to Luxembourg if he had instead accepted an offer in 1997 to become the consul general in Bermuda. Three years earlier former President Bill Clinton’s decision to name the heir to the Mid-West meat-packing fortune as ambassador to Fiji sank under opposition by officials in the South Pacific country and a Republican takeover of Congress in the fall of 1993. Undeterred, Mr. Hormel continued to lobby for a diplomatic post. He was named a delegate to the United Nations’ Human Rights Commission in Geneva as he sought to bolster his resume. Then came the offer of the Bermuda post, which did not require as extensive Congressional vetting as an ambassadorship did. Mr. Hormel declined the Bermuda post, saying he was “too naive to conceive of the assault the far right would launch against”.Then on October 6, 1997 Clinton named Hormel ambassador to Luxembourg. 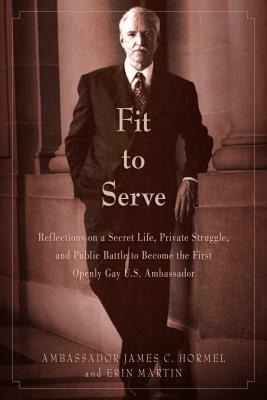 He recounts the episode in his new memoir “Fit to Serve: Reflections on a Secret Life, Private Struggle, and Public Battle to Become the First Openly Gay US Ambassador”. It recounts the anti-gay character assassinations Hormel faced as religious conservatives set out to torpedo his confirmation by the US Congress. Religious leaders attacked him as unfit to serve and several Republicans placed holds on his nomination due to the anti-gay attacks. President Clinton eventually used his recess appointment power to bypass the Senate altogether. Thus on June 29, 1999 Mr. Hormel became America’s first out ambassador. Shortly after President Clinton won the 1992 election, Hormel had dinner with Bob Farmer, at the time the Democratic Party’s national treasurer. Mr. Farmer was the first to suggest Hormel seek a presidential appointment. Mr. Farmer, who is gay, was in fact named consul general to Bermuda in 1994 and served until 1999. Out to Clinton and other officials in Washington, Mr. Farmer did not publicly discuss his sexual orientation until years later in an interview with the “Advocate” magazine. He said during his service in Bermuda he used “discretion” in determining whether to take his male partner to events. Mr. Farmer’s five-year stint was well received in Bermuda. He is credited with improving the American Consul General office’s relations with Bermuda. Bob Farmer is a friend to Bermuda and a really nice guy. He is always welcome back. Wish he had been “out” while he was here. 2 Words and a Comma might not have to STILL be fighting for basic human rights for the LBGT community.